In the past Kyrgyzstan shared the fate of almost all Central Asian countries, which were mostly parts of more powerful states, and only occasionally got independence. In the 1st century Kyrgyzstan was a part of the Kushan Kingdom. In the 6th century it was the center of the Turkic Khanate. Four centuries later the country became a part of the Karakhanid State. In the 13th century Kyrgyzstan was conquered by the Mongol-Tatars. In the 19th century the country first became a part of the Kokand Khanate, and then - of the Russian Empire. In 1926, after the revolution and civil war, the Kyrgyz Autonomous Soviet Socialist Republic (Kyrgyz ASSR) was established. In 1936 it was changed to the Kyrgyz Soviet Socialist Republic ( Kyrgyz SSR). On August 31, 1991 the country at last declared its political independence as the Republic of Kyrgyzstan. Of more than 2000 mountain lakes located on the territory of Kyrgyzstan, Issik-Kul Lake is indeed a wonder of nature. Lying at an altitude of over 1500 meters, it is a non-freezing salty sea-like lake. 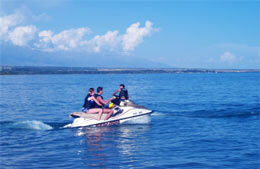 The size of the lake's surface is enormous: almost 180 kilometers long it reminds a sea gulf. Its depth is also of a sea size: a bit less than 700 meters. In width, at a distance of 60 kilometers off the shore only mountain ridges of the Kungei and Terskey-Alatau come into view. The sight of these snowy ridges reflected in the lake is strikingly impressive. Most favourable conditions for bathing, all delights of a southern sea-side but without sweltering heat even at the height of summer, curative radon springs and majestic mountain landscape - all this has made Issik-Kul resorts internationally popular. The famous Kyrgyz writer Chinghiz Aitmatov called the lake "a fragile pearl". Alongside with the unique and distinctive nature, the country has a rather eventful and interesting history. There are over a thousand historical and cultural monuments in Kyrgyzstan. Among them of great interest are cave dwellings of primitive man, petroglyphs and ancient runic inscriptions on boulders, stone statues and remains of ancient settlements and medieval fortresses. Through Kyrgyz territory ran Ferghana branch of the Great Silk Road. The remains of settlements and caravanserais which once gave shelter to tradesman traveling along this branch can be seen even today. The development of caravan routes that crossed the country facilitated the transition from nomadic to settled mode of life and to cattle breeding. 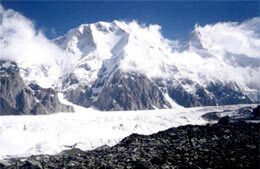 This can be traced in Talas, Chui Valley, the Issik-Kul area and central Tien Shan. The Kyrgyz have preserved their unprecedented epic "Manas", an encyclopedia-like source of what Kyrgyz society, customs, culture, and way of life of local people were over many centuries. Suleiman Mountain, Uzgen architectural complex, Buran Tower, Shakh-Fazil mausoleum and the caravanserai Tash-Rabat are the most significant archeological and historical sites in Kyrgyzstan. The national Commission of Kyrgyzstan has suggested that these monuments should be included into the UNESCO World Heritage List. As for the natural sights, the country's national parks should be especially noted. 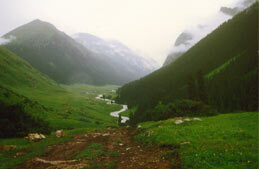 The national park Ala-Archa in Chui Valley is known for its relic woods of mountain juniper-trees. 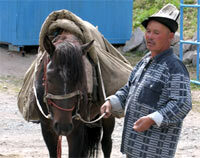 The national park Kemin provides every opportunity for mountaineering, boating and horse riding. It is worth seeing Altin-Orshan hot springs in a beautiful alpine valley, one of the world longest high-mountain glacier Inilchek, and the ravishing mountain lake Son-Kul. Kyrgyzstan, with its wide variety of beautiful sceneries and landscapes, is a perfect place for holiday-making, sport and recreational activities and even for research. Thus, a group of archeologists explore Cape of Saint Nose with a view to give grounds to the legend about biblical apostle Matthew who allegedly died on the shore of Issik-Kul Lake. Bishkek, the capital of Kyrgyzstan, is a growing young city with a population of about a million people (against only 6.5 thousand people in 1887, when it was a chief district town called Pishpek). Today Bishkek is a modern city with wide streets and lovely buildings. Its residents believe that Bishkek is the greenest of all the cities and towns in Central Asia. As any capital, Bishkek has a university, a number of colleges, theaters, museums, parks, and a comfortable residential area. Tourists, coming to the city by air, are welcomed at the new airport building Manas. Those coming by bus can enjoy the new comfortable bus terminal. As for the historical sites, Krasnorechenskoe - an archeological site of an ancient settlement - is of a special interest. Here the archeologists found dwelling complexes of the 10th - 12th centuries, rich in jewelry, cooking utensils and lamps. They also found there a silver statuette of Bodhisattva, which had originally come from India. The three-thousand-year-old Osh, is, perhaps, the most noteworthy town in Kyrgyzstan. This town was a center of many historic events, and one of the key points on the Great Silk Road. There are many different legends about the origin of this town. According to one of them, the settlement was founded by Solomon the Wise, after whom the mountain in the town center was named. In the Middle Ages Osh was a stronghold of Islam, whereas majestic Suleiman Mountain became a pilgrimage destination. At present the Museum of history and regional studies has been opened here, while at the top of the mountain there stands "Babur's House", which was indeed built by the military leader and poet Zakhireddin Babur, the ruler of India. He affectionately wrote that in Ferghana Valley there was not a town whose pleasantness and clearness of air could compare with that of Osh. Chui Valley is the granary of Kyrgyzstan. In summer it is full of orchards and fields of wheat, corn, alfalfa, and sugar-beet. Along the roads, right in front of the houses, there are lines of retail stalls. Sometimes the owners of the houses, acting as salesmen, do not even come out when honked. The travelers then can pick up what they want by themselves, leave the money and keep on going. Alay Valley is the area of summer mountain pastures, or "jailow". The valley, fenced in by Alay and Zaalay mountain ridges, is an enormous pasture where millions of sheep can graze. In spring one can watch the exciting "resettlement of peoples": endless flow of sheep, caravans of vehicles carrying the herdsmen with their families, their wigwam-like "yurtas", mobile power stations, shearing equipment - all on the background of snowy peaks fringed with emerald green mountain meadows. In the inner Tien Shan, at an altitude of more than 3000 meters, there are two large lakes: fresh flowing-water Son-Kul Lake and bitter-salty closed Lake Chatir-Kul. The Naryn is the basic river here, a Herculean maker of electric power. Its hydroelectric system produces millions of kilowatts, which satisfy the country's need for electricity. Kyrgyzstan is an agrarian-industrial country with developed machine-building and light industries and numerous deposits of coal, oil, mercury, lead, zinc and antimony being exploited on a wide scale. Today Kyrgyzstan is a secular independent state proceeding along the path of democracy. Situated in the very center of Central Asia, being at the meeting point of the civilizations, Kyrgyzstan has all the prerequisites for becoming a bridge of friendship and cooperation. This bridge is being built by all the countries of the Great Silk Road, including Central Asian countries.